The Certain Days: Freedom for Political Prisoners Calendar is a joint fundraising and educational project between outside organizers in Montreal, Toronto, and New York, in partnership with three political prisoners being held in maximum-security prisons in New York State: David Gilbert, Robert Seth Hayes and Herman Bell. The initial project was suggested by Herman in 2001, and has been shaped throughout the years by all of our ideas, discussions, and analysis. All of the current members of the outside collective are grounded in day- to-day organizing work other than the calendar, on issues ranging from migrant justice to community media to prisoner solidarity. We work from an anti-imperialist, anti-racist, anti-capitalist, feminist, queer- and trans- liberationist position. This calendar launch party will featuring artists and contributors to the 2017 calendar including Laura Whitehorn, Sophia Dawson, Naomi Jaffe, Daniel McGowan, Jenn Meeropol, and reps for Leonard Peltier and Oscar Lopez Rivera. There will be art on display from the calendar, refreshments, and the 2017 calendars for sale! 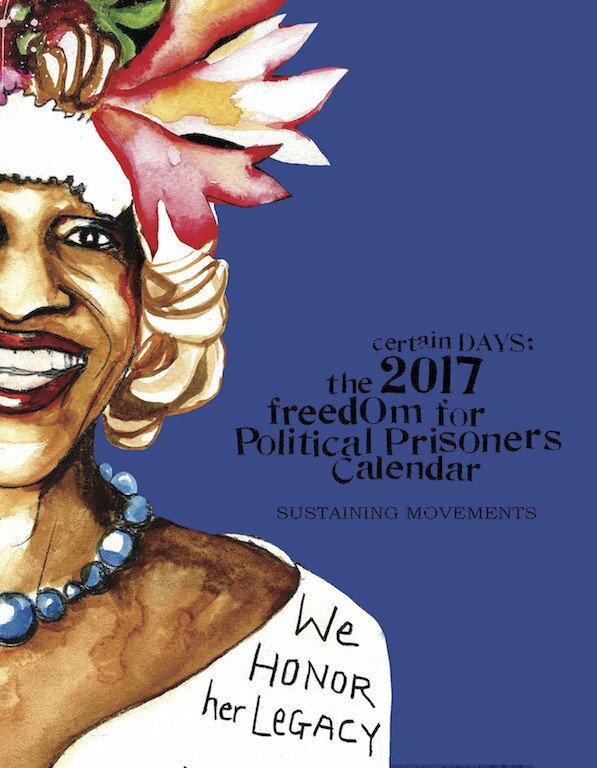 The 2017 calendar’s theme is “sustaining movements” and features art and writings by Farha Najah, Sekou Odinga, David Gilbert, Daniel McGowan, Free Oscar López Rivera Now, Sophia Dawson, Chris Dixon, Emory Douglas, Laura Whitehorn, Mumia Abu Jamal, Xinachtli, Micah Bazant, Capital Area Against Mass Incarceration, South Asian Women’s Community Centre, Mazatl, Support Marius Mason, Eric King, Kevin “Rashid” Johnson, Jennifer Meeropol, International Leonard Peltier Defense Committee, Amanda M Priebe, the Termite Collectie, Walidah Imarisha, Ali Cat Chavez Leeds, and more. The proceeds from Certain Days 2017 will be divided among these groups: الضمير لرعاية الأسير Addameer Prisoner Support and Human Rights Association, Release Aging People in Prison—RAPP, and the Unist’ot’en Camp. Interference Archive event page HERE.